Airline Transport Professionals (ATP) today announced a new addition to its renowned training curriculum, the CFI Program. ATP's CFI Program provides all necessary ground and flight instruction for the three CFI certificates: Single-Engine, Multi-Engine and Instrument. This fast, efficient and thorough program requires only 21 days to complete and includes all study materials. The CFI Program follows the same methodology of the Airline Career Pilot Program, total immersion in training over a short period of time. This teaching method allows for a great deal of information to be absorbed quickly, enabling students to successfully reach their goal of becoming a Flight Instructor faster and to immediately begin building experience and earning money as a CFI. With the airline industry in a cyclical downturn, ATP had many pilots inquire about flight instructing to build hours and experience in preparation for the next wave of airline hiring. As the leader in airline pilot training and pilot career development, ATP felt that the program was a necessity in order to facilitate the training of CFIs. The program is currently being offered in Arlington, TX and Las Vegas, NV. Beginning October 13, 2008, the course will be offered in Jacksonville, FL and Atlanta, GA. In 1984 ATP pioneered accelerated, professional multi-engine flight training with an emphasis on pilot career development. Today, ATP’s Airline Training Programs prepare pilots for airline careers with nationwide flying experience in multi-engine aircraft. Airline hiring partnership letters with 10 leading regional airlines recognize the value of this experience. ATP currently delivers more pilots to the regional airlines than any other single flight school, college, or academy. 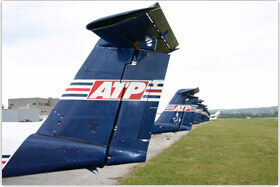 ATP flies over 11,000 hours and provides more than 450 FAA pilot certifications each month at 20 locations nationwide.